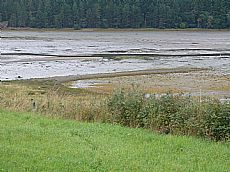 At low tide the remains of a gravel tongue can be seen extending into Munlochy Bay from the southern side of the bay, an inlet of the inner Moray Firth on the Black Isle. The jetty is depicted on the 1st edition OS map, but marked as ‘Old Jetty’ on the second edition. At an angle from the gravel tongue the stumps of a wide, wooden pier still survive (see photo below right), although it is no longer visible how the wooden pier joined to the gravel tongue. 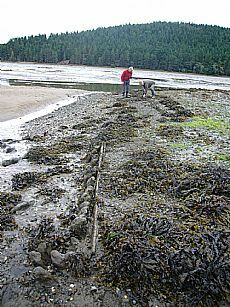 This provided access to the channel at low tide. A number of bricks and cylindrical tiles can be seen along the jetty and on the shore. Alasdair Cameron has discovered press adverts placed by the Kilcoy estate factor showing they were landing drainage tiles at the pier and wanted contractors to take them from the pier to Tore. But there is ample clay in the area, particularly at the Bay. There was at least one local tileworks in the area. Were they also at some point exporting tiles too? 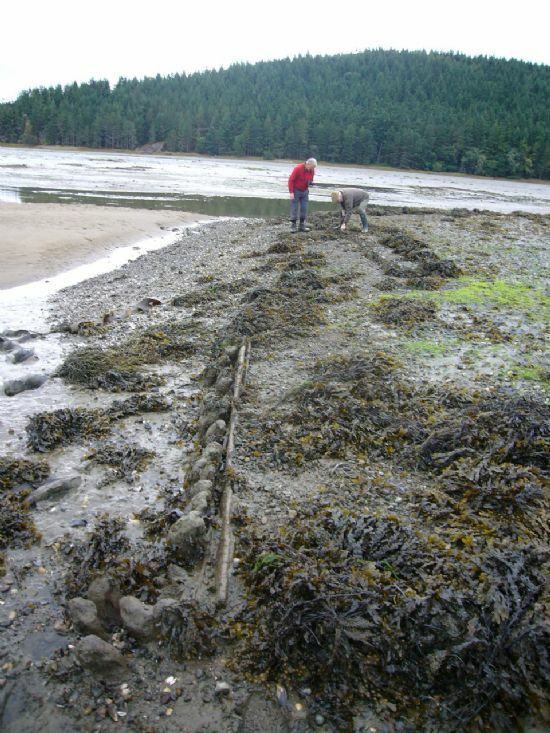 Nearby on the shore is a low mound, which a local resident remembers as the remains of a storehouse. The rectangular building appears on the first edition OS map, but is ruinous by the second. The low walls can still be probed. Further information about the use of the jetty and the local tile industry in the area are still needed. The bay has deep blue clay, and has been used as a source for clay over many years, including into modern times. 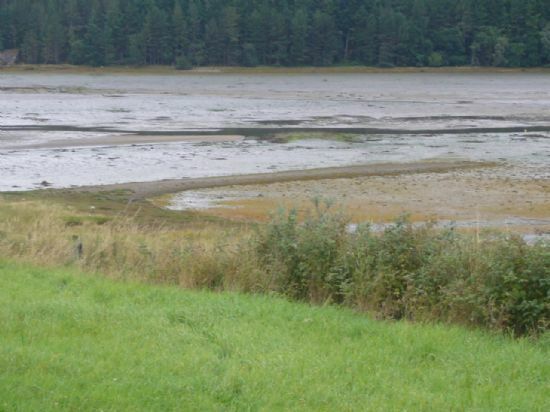 It is one of several places under investigation by the North Kessock and District Local History Society Feats of Clay project, as a possible source for the late Bronze Age clay moulds for casting sickles found at North Kessock (see Find of the Month August 2013).